Adapt your Mini-DP / Thunderbolt socket to work with a 4K HDMI monitor! Easily connect your Mini-DisplayPort / Thunderbolt equipped MacBook Pro or Surface Pro to a 4K HDMI TV using this 15cm adaptor and a version 2.0 HDMI cable! Anyhoo - the specs are truly top-shelf. It's a Fully certified Mini-DisplayPort male to HDMI female adapter. It has DPCP as well as HDCP and supports all HDMI resolutions thusfar encountered in the wild including 4K at 60hz! Of course, it can also do audio, but you will need to check your product specs to make sure your source device actually outputs audio over mini-DisplayPort, or you'll only get video. It's a hard world, right? But the blow is softened thanks to a 15cm lead which will save stress on your sensitive equipment when you connect up a male-to-male HDMI cable. Other than that, it's a straight shot! If your mini-DisplayPort source has support for HDMI compatible video output, it's as simple as plug-and-play. Check your manuals or look for the D++ symbol to know if your source is ready for the conversion. This cable is not bi-directional, and does not convert HDMI to Mini-DisplayPort. Please note that ALL of your components will need to support HDMI 2.0 or higher to achieve 4K 60hz. This includes the Mini DisplayPort, HDMI cable, the HDMI port in your screen and the screen itself. Please note that the Microsoft Surface & Surface 2 do not support HDMI output over Mini-DP. Supports HDMI signals such as 576i, 576p, 720p, 1080i, 1080p, 1600p and 4K at 60 frames per second! Mini-DisplayPort (DP) adapters are not bi-directional, and require a Mini-DP output which is DP++ (Dual Mode) compatible. 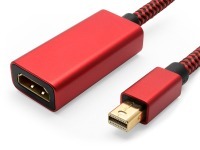 When a MIni-DisplayPort to HDMI adapter is connected to a DP++ (Dual-Mode) connector, the output device senses the presence of the adaptor and sends HDMI signals over the Mini-DisplayPort connector rather than Mini-DisplayPort signals. No signal conversion is performed by the adapter. HDMI signals are merely passed through.